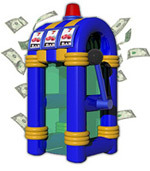 Whether you choose a classic money booth or an inflatable cash cube - a money machine can turn a promotional event from 'so-so' to an interactive, high-energy event. 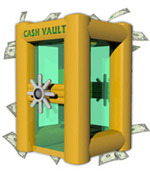 The unique construction and quality materials mean that these money blowing machines are some of the most preferred cash machines in the industry. 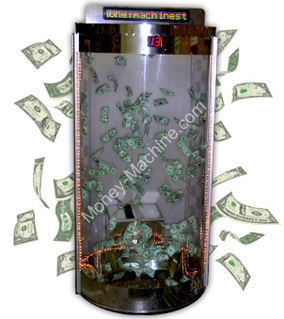 The money blowing booth has a polished stainless steel construction, special effects lighting, a personalized electronic message display and a digital clock. 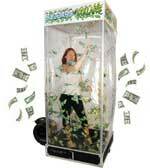 Onlookers can see the action from all sides -- the cash cube money machine has a see-through case on three sides, making it ideal for a trade show booth, in the center of a casino floor, or as an in-store or outdoor promotional attraction. 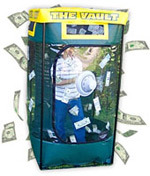 When the Money Machine is at an event, crowds will gather and hope for a chance to spend just a few minutes inside to grab at cash, 'funny money,' coupons, or vouchers. Whether you're collecting new leads at a trade show, hosting a grand opening event at a new location, or just want to get attention - marketing tools like a money machine or cash cube drive people to your location and can have them lining up for a chance to participate. Within the business community, a good marketing strategy is the ultimate must for organizations that want to thrive in even the most difficult financial climates. The success PromotionStore.com has had in assisting with the marketing goals of its wide variety of clients has a great deal to do with the promotional tools the company can provide. There is a recognized need for organizations to develop new marketing strategies that increase product or organization recognition. Many possibilities exist for attracting attention; however, getting the most from your promotional dollars requires a solid promotional method for achieving your objectives. 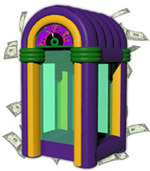 The money machine has been used in a number of ways throughout various industries. Here are some of the many companies and educational institutions that have incorporated a cash cube into its promotions. 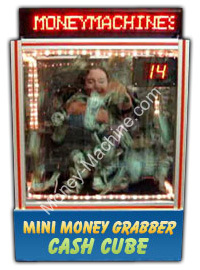 Investors Savings Bank held a Grand Opening Event in Morristown, NJ where present attendants (18 or older) were given 15 seconds inside a money blowing machine to grab as many bills as possible. Bills included $1, $5, $10, and $20 with an occasional $100. The press release announcing this event read 'Free Money Up For Grabs in Morristown.' Needless to say, the turnout was notable. The Eastern Michigan University's Employee Wellness Fair featured many wellness booths, including locations for free massages and blood pressure checks. 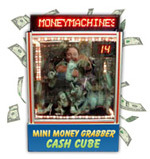 Additionally, a cash cube money machine was set up to illustrate the philosophy of money management by teaching participants to grab their money and hold on. In January of 2009, Southwest Airlines rented a money machine for the New Orleans Louie Armstrong International Airport location, drawing in crowds to a celebration of 30 years of service in the Big Easy. A well known financial institute - Wachovia - uses the money booth for contests and charity, and used the money blowing booth to kick off the Way2Save Challenge. Every year at the New York State Fair, visitors line up at the Channel 9 News Station money booth, hoping their name will be drawn for a chance to spend 30 seconds in the money booth and that they'll leave a little richer. The Clearwater Casino in Washington is one of many casinos that have recognized the entertainment value of a cash cube, and offer one on site for fun & entertainment. The Credit Union Association of New York provided a money machine to enhance the entertainment during a grand opening celebration of a new financial institution in Henrietta, NY. 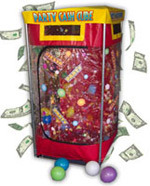 Companies, schools, and non-profits big and small use the money blowing booth to develop fun promotions that get people involved. For example, as part of a year-end fundraiser for an Elementary School, students who sold a certain amount of cookie dough or pizzas were rewarded with 30 seconds in a money booth. Car dealerships, banks, radio stations, and casinos use the cash blowing machine to get the public hyped about their special event -- the opportunity to grab fistfuls of cash, coupons or vouchers is a powerful way to get people lining up for any local event. 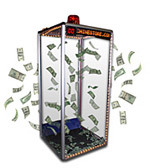 We offer money booths are light weight and easily transported when your event is over. Whether you are a part of a small company or a large one or if you're looking to rent or buy a cash cube, we are available to customers from coast to coast. 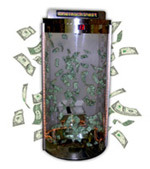 Call us toll free at 800-573-3111 and we'll help you find the perfect Money Machine size and style to help you reach your promotional goals.